After the Federal Court of Australia granted an Apple motion for a preliminary injunction against the Galaxy Tab 10.1 on Thursday, I pointed out immediately that the technical scope of the decision was broad enough to put any new Android product at risk in the Australian market. This is an important strategic question, and now that the detailed decision (with only a few redactions) has become available, I wanted to follow up and explain in more detail why Apple is -- if it so chooses -- very likely to obtain additional preliminary injunctions against other new Android products ("new" because preliminary injunctions are granted only in urgent cases, not with respect to older products, which can only be shut down in a full-blown proceeding). The Australian Galaxy Tab 10.1 decision is really worth reading, but it's quite long (approximately 65 pages). In my previous post I quoted a couple of passages from it that prove Apple isn't willing to license all of its patents to Samsung (and other Android device makers who are only competitors, not suppliers like Samsung). Apple intends to keep the iPhone and the iPad unique. The innermost circle (circle #1) is the nucleus. It contains only the Galaxy Tab 10.1 -- the product the decision formally relates to. The next circle (#2) contains all Samsung Galaxy products (smartphones as well as tablets), since those products are designed to resemble the iPhone and the iPad to the greatest extent possible. 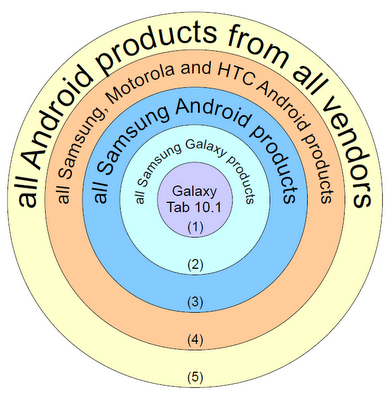 Circle #3 contains all Samsung products, adding those product lines that aren't iPhone and iPad look-alikes. 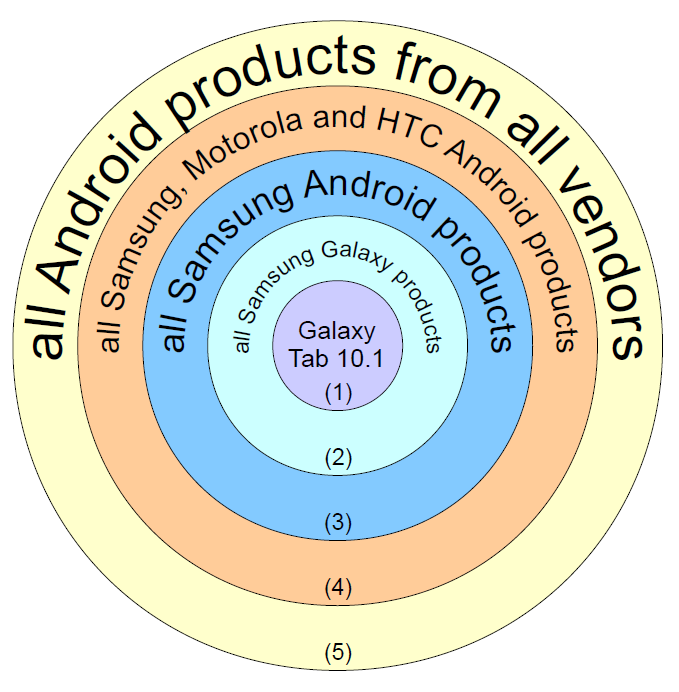 Circle #4 adds Motorola Mobility and HTC -- the other two Android device makers with which Apple is in litigation. Finally, circle #5 throws in the rest of the Android ecosystem, which Apple isn't suing yet (those vendors include Acer, Amazon, Barnes&Noble, LG, SonyEricsson, and dozens more). Note that this is all about a preliminary injunction and about the possibility of other preliminary injunctions. Apple was interested in resolving this case as quickly as possible on a definitive basis, but Samsung refused, which is why the final trial won't be held before March 2012. The March decision can convert the preliminary injunction into a permanent one, based either on both of the asserted patents or on just one of them (in which case its technical scope would be narrower, but still broad enough to be nothing short of disastrous for Android), or it can deny a permanent injunction, in which case Apple will owe Samsung damages for the period during which the preliminary injunction was in force. In my view, Samsung and Google have to fight very hard to prevent that this injunction becomes permanent. Assuming that the injunction does become permanent and all appeals fail, it will be GAME OVER DOWN UNDER for Android. In that scenario, Apple can easily shut down any Android-based multitouch-capable product. But we still have five months to go between now and the final hearing. In the meantime, Apple will continue to litigate against Samsung, HTC and Motorola in various countries, and it would make a lot of sense for Apple to capitalize on the favorable situation in Australia in order to gain even more leverage over its rivals. As I explained before, Apple could seek preliminary injunctions only with respect to new products launched by rivals. Under the headline "The Reality of Apple's Australian Injunction Against Samsung", another blogger argued that "the reach of the injunction is limited" and mentioned the fact that "[t]he Galaxy Tab 7 inch is sold in Australia, but is not included in this injunction". The 7" version is about a year old. There's no way it could have been included in this preliminary injunction or targeted by another one. That window closed many months back. Such an unsuitable example obviously calls into question the analysis at large, especially since the original version of that article had an incorrect list of patents-in-suit and its author linked to a document as the "decision" that was another decision in connection with this dispute, but not the preliminary injunction ruling. While I'm on the subject of people who disagreed with my warning concerning the extendability of the decision, bear with me for another related digression. One of the craziest things I've seen in a long time was a quote from an Australian patent lawyer who told a media group that "the practical reality is that legal action is costly, and Apple will most likely continue to carefully pick its battles in order to maximise the value it obtains from its IP enforcement activities". Seriously, would Apple, which hoards about $80 billion in cash and has huge profit margins on each device it sells, ever be restricted by legal fee considerations when it has an opportunity to shut down Android devices? I could see that Apple's in-house legal department is so busy it doesn't want to be distracted too much. But there's no question that legal fees won't deter Apple from enforcing its rights. It's probably already spending more money on its Android lawsuits in the U.S. than the fee income of all Australian patent lawyers combined. That cost theory is also belied by the fact that Apple also requested (and obtained) a preliminary injunction against a small German company named JAY-tech. Back to the real issue. Let's assume that Samsung decides to launch a Galaxy S3 in the near term -- or that, alternatively, HTC launches a new Evo. If Apple filed a request for a preliminary injunction in Australia based on the same patents as the ones asserted against the Galaxy Tab 10.1, the court would in all likelihood assign the new case to the same judge, for the sake of efficiency. Otherwise another judge would have to become acquainted with the patents and technologies at issue. Even if the judge who presides over the Galaxy Tab 10.1 lawsuit wasn't available, the court wouldn't reach new conclusions on the common aspects of the two preliminary injunction motions as long as there are no new facts on the table. If, for example, additional prior art was shown in a new lawsuit, then the court might arrive at a different conclusion concerning the validity of the challenged patent. But otherwise, there will be no surprises. The patentee has to show a sufficient probability of prevailing at the end of the full-blown proceeding. The sufficient probability standard is different from the preponderance (of the evidence) standard known in connection with various legal tests in the United States. The Galaxy Tab 10.1 decision explains that the likelihood of ultimate success has to be "sufficient" in light of the second consideration, balance of convenience. In other words, if a court finds that a preliminary injunction doesn't cause an alleged infringer a lot of inconvenience as compared to the inconvenience it causes the patentee to have to tolerate the ongoing alleged infringement, then even a limited probability of succeeding at the end of the case -- lower than the preponderance standard -- might work. Australian law requires the patentee to have a "prima facie case", meaning that there's enough of an indication based on an initial (by definition non-final) analysis. "Balance of convenience" is an analysis that assumes, on a hypothetical basis, the harm either party may suffer unjustly from a decision that could turn out (at the end of a full-blown proceeding) to have been erroneous. The patentee would suffer from having to deal with an illegitimate competing product in the market; the alleged infringer would suffer from being shut out of the market for no valid reason. An Australian court looks at both scenarios and tries to compare them. If a wrong decision does more damage to the patent holder, then an injunction will be granted if there's a sufficient probability that the patent holder will indeed prevail at the end of the full-blown proceeding. If a wrong decision does more damage to the alleged infringer, then it will be hard (or in some cases even impossible) for the patentee to show a sufficient probability of success at the end of the trial. Let's now look at the two criteria and apply the Galaxy Tab 10.1 decision to hypothetical new Android-based products from various vendors. I have read the infringement analysis (which includes a patent validity analysis) in detail. There can be no doubt that the asserted patents either read on all Android-based multitouch-capable product or on none at all. Those aren't tablet-specific patents like th design-related right Apple is asserting in Germany. Those are one hardware and one software patent, and both are essential to making capacitive multitouch work. There are reasons for which Apple decided to attack the Galaxy Tab 10.1 in various markets. It's the first high-profile Galaxy product Apple was able to target at launch time after it decided to seek preliminary injunctions against Samsung around the globe. But in all the countries in which the two companies are suing each other, Apple is also suing Samsung over its Android-based smartphones (in slower, full-blown proceedings). There are no technical reason for which the Galaxy Tab 10.1 decision wouldn't be applicable to other Android-based tablets and to any Android-based smartphones, in each case irrespectively of the vendor but provided that a device provides capacitive multitouch functionality. Without capacitive multitouch, Android would have a future on only the cheapest so-called feature phones but wouldn't be competitive in the smartphone segment. Whether the court will uphold its infringement analysis at the end of the full-blown proceeding remains to be seen. The decision acknowledges that some of Samsung's arguments have "force" and may succeed at the final trial, but Apple was able to show a "prima facie case". In other words, both parties showed a sufficient probability of being able to win the final trial, but Australian law favors the right holder who only needs to show a sufficient probability while the alleged infringer must have such convincing arguments for the invalidity or non-infringement of an asserted patent that the probability in favor of the right holder falls below the "sufficient" level. Samsung's arguments weren't that bad, but they weren't good enough to take the likelihood of an Apple victory below the (not too high) threshold Apple had to meet. Samsung apparently wasn't too convinced of its own arguments: it opposed an expedited trial, which could have taken place in November. Apple was trial-ready -- Samsung was afraid. The way I understand the decision, I doubt that Samsung can achieve a more favorable outcome unless it presents prior art that it hasn't previously shown to the court. If it just tries to make a stronger case for the same arguments again, I think Apple will win again. The balance-of-convenience analysis has multiple components. The judge gave them different weight. I'll now explain how the judge put the different elements of the analysis into Apple's, Samsung's or a neutral column, and what the same analysis would look like for new products corresponding to the circles #2, #3, #4 and #5 in my chart further above. Samsung argued that Apple wasn't able to back up with hard evidence its claims that the presence of the Galaxy Tab 10.1 on the market hurts Apple's sales, and that Apple would suffer harm beyond short-term sales (such as follow-on sales of apps). But the judge made it very clear that Apple's related claims were, to the extent accepted by the court, logical and didn't require evidence, especially since it wouldn't even be possible to prove some of those claims by statistical means (for example, if sales of the iPad 2 grow fast, there could still be damage due to a competing product but the numbers might not show it). The judge concluded that the detriment factor favors neither party: Apple couldn't convince her that it would suffer more than Samsung, nor the other way round. All of the types of harm that the judge evaluated are applicable to all vendors. It's a safe assumption that motions targeting other new Android-based products would not result in a conclusion more favorable to Apple's adversaries as far as the "significant detriment" criterion is concerned. "Considering its physical similarities to the iPad 2, I accept Mr Small's unchallenged evidence that the launch of the Australian Galaxy Tab 10.1 would damage Apple's reputation for distinctiveness in functionality and design of consumer electronic products." However, since the "significant detriment" factor has many aspects, I don't think that products looking less similar to Apple's products than the Galaxy Tab 10.1 would get away with an infringement of Apple's hardware and software patents. This was a subset of a subset of the consideration for the judge, and a more distinctive design wouldn't be enough to decide the "significant detriment" factor in favor of another defendant. The judge found that both parties would suffer harm from an unjustified preliminary injunction beyond what could be compensated by means of a damages award. As a result, this factor was also put in the neutral column. There is no reason to assume that the outcome would be less favorable to Apple in other cases. The underlying idea of this factor is that the shelf life of the products in question is so short that a final decision taken in March 2012 would be too late with a view to the Galaxy Tab 10.1. That product might still be on the market then, but it would have lost most of its relevant due to newer products. There was one consideration in this context that tipped the scales in Apple's favor: Apple was ready to take this case to an expedited trial, but Samsung refused. The judge basically didn't want to give Samsung the benefit of the "diminution" factor given that Samsung wasn't cooperative in limiting the impact of this consideration. If Apple brought requests for injunctions against future Android products, it would depend on each party whether it accepts an expedited trial or not. Apple would presumably support an expedited trial in all such lawsuits. The companies it sues would have to decide whether they accept an expedited trial or, in the alternative, have this particular factor put in Apple's column. The judge didn't want to treat as a separate factor the question of whether the status quo in the market (meaning the unavailability of the Galaxy Tab 10.1) should be preserved. That consideration was part of the judge's analysis of potential harm to Apple. There's no reason to assume that this factor would stand on its own in any future proceeding brought by Apple. Samsung argued that Apple brought this lawsuit too late since it had been aware of other Android-based products (from Samsung and other vendors) long before this lawsuit. But the judge said that the only relevant consideration is whether there was a delay in connection with the product accused in this action. Apple could also satisfy the timeliness requirement with a view to future Android-based products if it sues shortly before or after their launch in the Australian market. Samsung proceeded with "eyes wide open"
The judge determined that Samsung infringed with "eyes wide open" since Apple previously sued it in the United States but it tried to launch other potentially infringing products, such as the accused Galaxy Tab 10.1, at any rate. But given that any delays of new product launches by Samsung would have had pretty much the same effect as an injunction being ordered against Samsung, the judge gave this factor only minimal weight. This means that the question of whether Apple previously sued another party or otherwise put it on notice isn't extremely important. However, the judge also made it clear that this decision was a narrow victory for Apple (not in terms of the technical scope of the decision, which is broad, but in terms of Samsung having been relatively close to avoiding an injunction). In a narrow decision, even a factor of "minimal weight" can play a role. With a view to the five circles I showed further above, there's no doubt that any actions against future Samsung products would enable Apple to decide the "eyes wide open" factor in its favor. The same would apply to Motorola and HTC: Apple sued these companies even before it sued Samsung. As far as other Android device makers besides the "big three" are concerned, I still think the "eyes wide open" factor wouldn't prevent Apple from succeeding. In order to be sure, Apple would be well-advised to put those on notice of its infringement allegations. But it's also possible that the court will assume that the injunction against the Galaxy Tab 10.1 must have been known to the industry at large. In that case, everyone else would now proceed with "eyes wide open", and this could even make Apple's case against future infringers stronger. The judge attached significant weight to the fact that Apple's infringement assertions were sufficiently probable to succeed with respect to "two separate, registered patents". In other words, this fact made the judge comfortable that Apple was particularly likely to prevail on at least one of those two patents at the final trial. In light of the above, it will be very interesting to see what happens when some of Apple's rivals -- especially the "big three", all of whom Apple is already suing in the U.S. and elsewhere -- try to launch major Android-based products in the near term. Apple would be in a pretty good position to delay or prevent those product launches. I never doubted that new complaints would require due process: Apple would have to prove its allegations, and defendants would have a chance to tell their version of the story. But the court would be able to proceed much more quickly than the first time that Apple brought these issues before it.